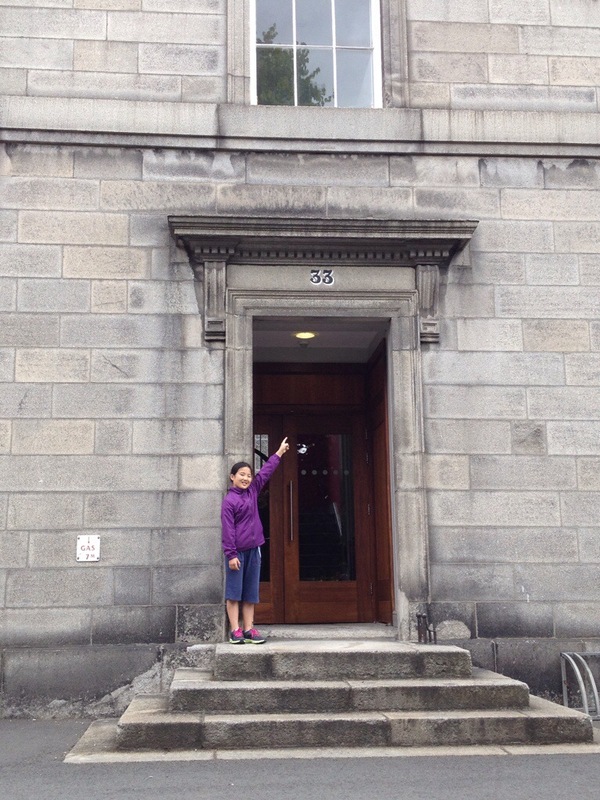 Today we stuck close to our Trinity College “home” after a weekend of traveling around the Irish country- and seaside. We slept well and took the morning fairly easy. I stocked up on some provisions at the little shop on campus, and then I did three loads of laundry simultaneously at the launderette (for €15 or about $20!). Mom and dad kept me company, and Reed showed up to help tote the clean piles of clothes back to our apartment. Small, yet large, blessings indeed. Back to our day… When we returned to campus, we went to the Old Library to go (wait in line to) see the Book of Kells. This is Ireland’s most treasured possession, so it is a true must-see (even though we had seen it before). It is a beautifully decorated, illuminated Biblical manuscript dating from around AD 800. After you read about the book, how it was made (it took 185 calves to make the vellum pages! ), and see some other ancient manuscripts, you go into a dimly lit room and there it is, in a big glass case under soft lights. There are four volumes but only two are on display at any one time. We saw an open page in the gospels of John and Luke. It truly is beautiful (no photos allowed). But, it gets even better, in my opinion. Next you ascend some stairs to enter the Long Room, which is the amazing old library. It looks like something straight from Hogwarts (sorry for yet another Harry Potter reference; they will likely keep coming). There are two levels of tall, wooden bookshelves, and the rows are lined with statues at each end. A bonus this time was an exhibit of Brian Boru, the Irish king who battled the Vikings and died in the battle of Clontarff in 1014. The artwork in this exhibit is magnificent (see/read more here). I was looking forward to seeing it as I had read a bit about this part of Irish history (thanks, Faye! ), and I marveled at both the art and the story. We walked around campus a bit after we left the Old Library, and then we wandered back to our apartment for awhile. I took my folks out for a little shopping (we had to replenish our Irish shortbread cookie supply), and we FaceTimed with my sister and nephew so mom and dad could get caught up on the happenings in Iowa. 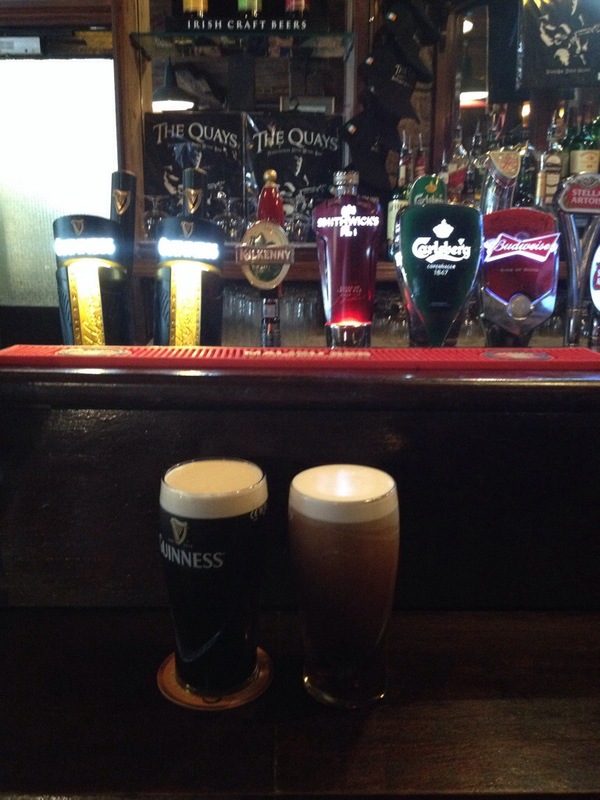 Reed left to meet up with the students for class at “their pub” out in the suburb of Clondalkin where their home stays are. I cooked some scrambled eggs in an aluminum takeout pan (we have no cookware) and made some toast for the rest of us for dinner. Pretty gourmet (not). 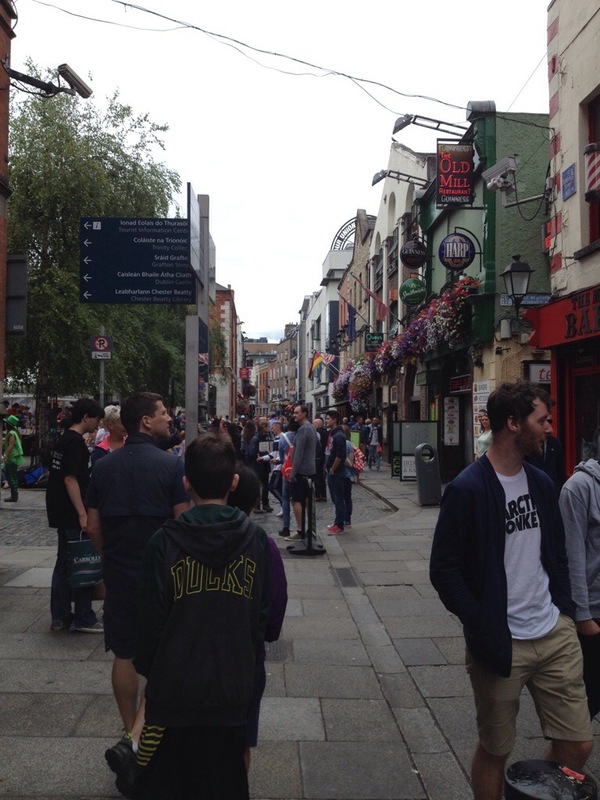 We have tomorrow in Dublin before heading to Edinburgh early Thursday morning, so we will see what the day holds! Today I woke early and headed to the airport to fetch my parents. They arrived on time and had a fairy easy journey from Iowa (via Chicago). They commented on how it takes about the same amount of time to fly to Dublin as it does to drive to Indianapolis (which my dad had just done for our nephew’s AAU basketball tournament), and it is a whole lot easier than flying to South Africa! Perspective can be a helpful tool! We stowed their luggage at their Trinity City Hotel as their room wasn’t yet ready (it was only about 9:30) and we headed to our apartment. The kids and Reed were glad to see them, and we visited for awhile over morning beverages. Then my folks, Abbie, and I headed out to catch the big green “hop on/hop off” bus tour. I thought it might be a nice way for them to get oriented to Dublin without too much exertion. We hopped off at Merrion Square and visited Oscar Wilde’s statue, something I had been wanting to do. We hopped back on the next bus and got lucky with witty live commentary. So, rather than hopping off again, we rode most of the rest of the route before meeting Jackson and Reed for lunch. 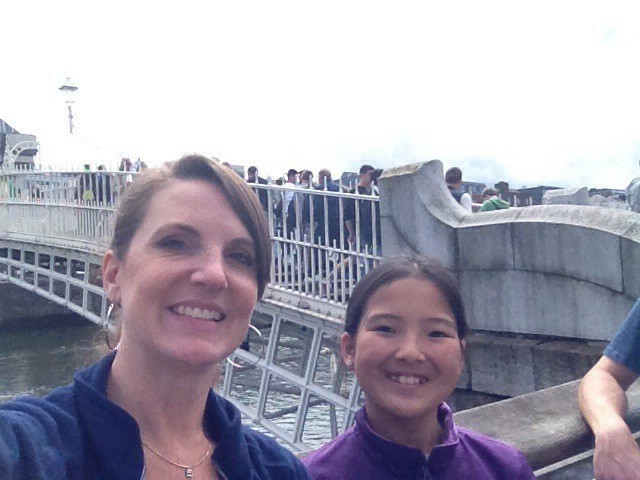 We heard a bit of history, a pinch of humor, and skosh of sarcasm while winding through Dublin. It is a very interesting city with lots of character…there are a few sites I’d like to go back to and hop off to visit. 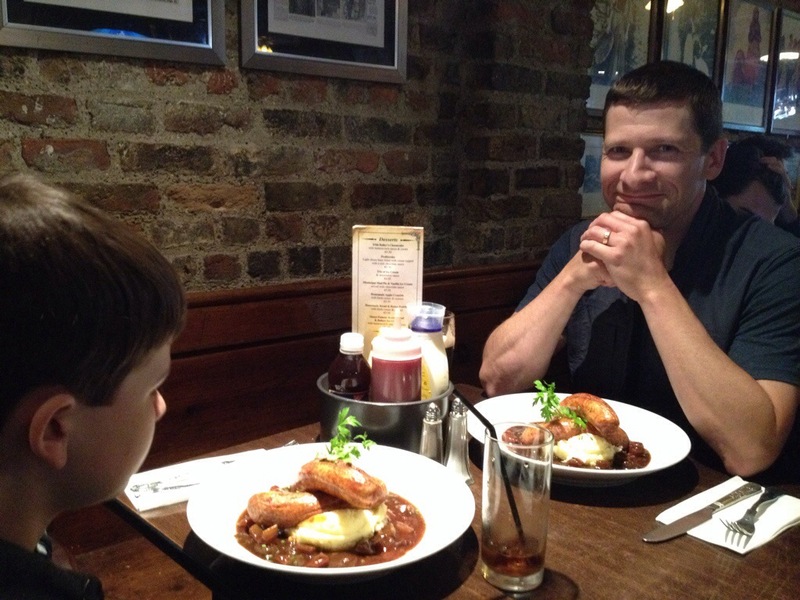 We lunched again at The Duke and enjoyed sandwiches, soup, and chips (aka fries). My dad had his first (half) pint of Guinness,which I think he enjoyed. We get to tour the Guinness storehouse tomorrow, so it will be fun to learn more about the Guinness family and their legendary black liquid. Then I got my folks settled into their posh hotel room so they could relax and freshen up before Riverdance. Speaking of which, it was amazing! The dancers and musicians are so incredibly talented, and to see Riverdance in Dublin is beyond compare, in my opinion. The finesse and coordination exhibited is hard to put into words…truly spectacular. The show grew a little long for the kids, and my folks were pretty tired by the end after their super long day, but it was a delightful evening. The students enjoyed it too, and they were headed home after a full day. Here’s hoping everyone – all 10 of us – sleeps well! We arrived midday Saturday after an easy journey, and our American Institute of Foreign Study (AIFS) guide, Tony Langan, was at the airport to meet us. All but one of our students was on our 10-hour flight from San Francisco, and the other one was waiting with Tony when we arrived. 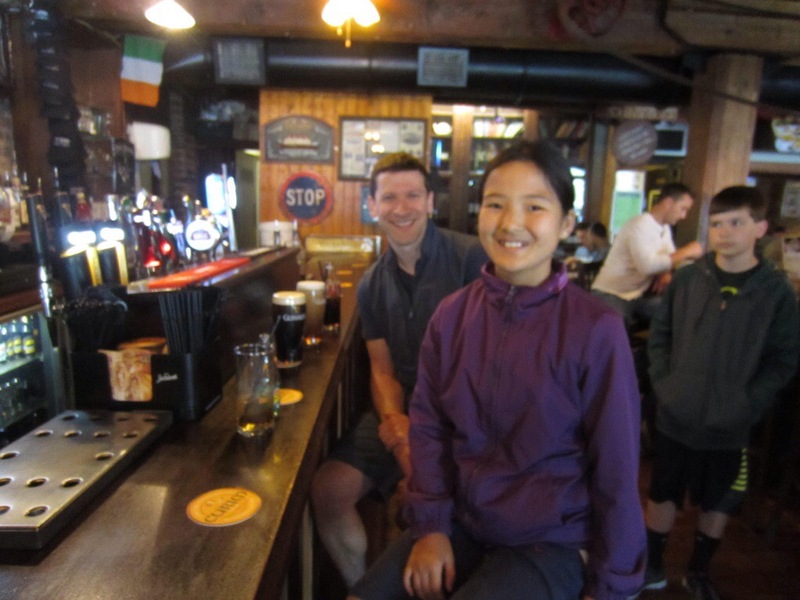 Tony sent the students in one taxi to their home stays, which are in a suburb of Dublin, about a half hour or so from city center. 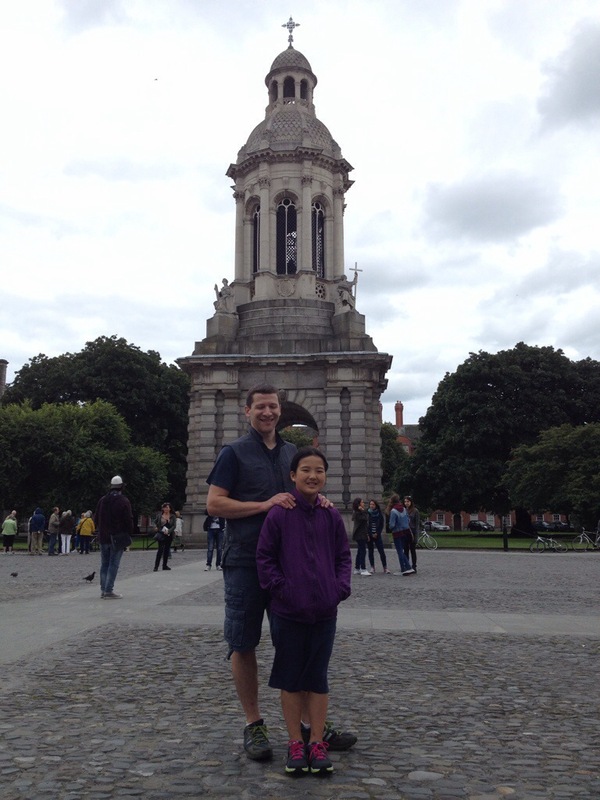 He rode with us in our taxi to settle us into our accommodations at Trinity College, right in the heart of Dublin. We have a nice apartment and feel quite lucky. 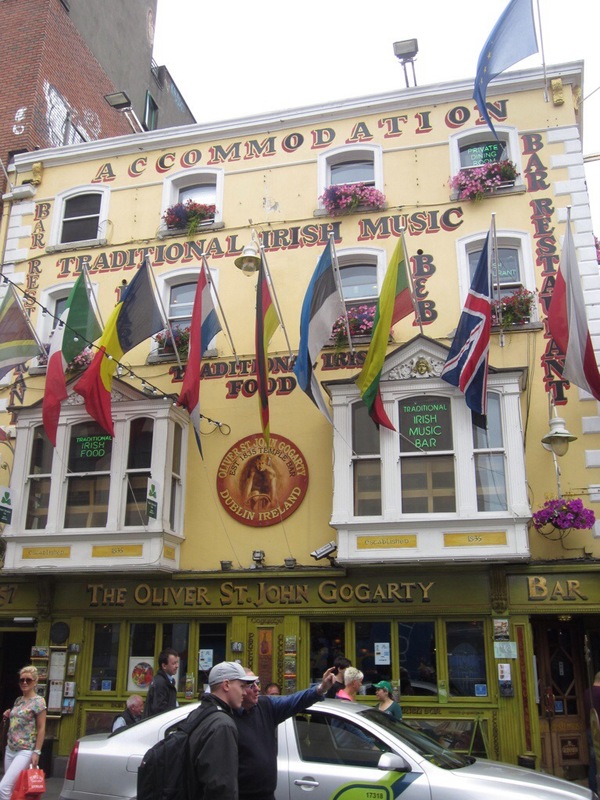 A typical Irish pub…we are going to this one tomorrow night with our students.